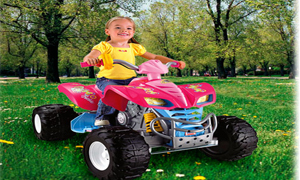 The thrill of real driving fun, plus realistic Power Wheels Barbie Kawasaki KFX styling with a pink Barbie twist takes girls on all kinds of “ATV” adventures! Power Wheels exclusive Monster Traction drive system powers the KFX through the toughest driving conditions like never before—over ruts, wet grass, gravel, mud, and more. Get ready for an exciting backyard driving adventure! Ages 3 years and up, Weight Limit: 65lbs. Barbie Kawasaki KFX with Monster Traction is ready to take on any adventure no matter what terrain it may come across! Realistic ATV features with fun Barbie graphics for girls! Features big tires and a cool twist-grip throttle that revs this Kawasaki KFX into high-speed. Barbie Kawasaki KFX drives two speeds forward (2.5 and 5 mph, max. 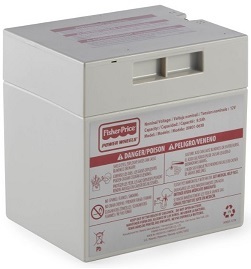 ), one speed in reverse (2.5 mph), on hard surfaces, grass and rough terrain. Realistic sport ATV styling with fun Barbie graphics fuels imaginative role-play adventure, with fast and flashy looking “chrome” accents that make the Kawasaki KFX even more “real” and “cool.” Driver-friendly features include a high speed lock-out for beginners and Power Lock Brakes! Driving a “real” vehicle, maybe even just like the one you drive, gives kids a feeling of independence, accomplishment and self-confidence—all of which are important to healthy social and emotional development. Learning to go forward and backward, change speeds, steer, stop and go is good for them, too. Physical motion aids in the development of motor skills, balance and body awareness, and built-in role play features fuel endless imagination (and of course, it’s just plain fun and exciting). Every Power Wheels vehicle is built Fisher-Price tough, with innovative play and performance features you won’t find in other ride-on vehicle. Only Power Wheels vehicles come with a comprehensive One Year Bumper-to-Bumper Limited Warranty backed by 300 service centers throughout the country. Before they’re produced, Power Wheels vehicles are put to the test on our own in-house Quality Assurance Test Track to ensure quality performance, mile after mile. They’re put to the test by kids, too, in the Fisher-Price onsite Play Lab and through the Fisher-Price in-home test program, to make sure they’re age-appropriate, easy to operate, and of course, fun to drive. 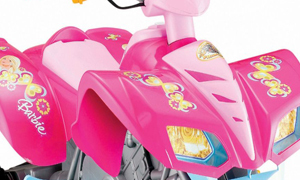 Barbie Kawasaki KFX, Power Wheels rechargeable 12-volt vehicle battery, Power Wheels 12-volt charger, two assembly wrenches, and Owner’s Manual. Sturdy base and strong tires with tread create a fun ride!